We have, over time, put Thor Equities proposals for and actions in Coney Island under a microscope. More than once, we have taken them to task for overlooking blogs in their communications strategy, even though online coverage has formed the foundation upon which other coverage has been built. So, we found it fascinating this weekend when Thor's public relations firm, the Marino Organization, chose to communicate with Gowanus Lounge, Kinetic Carnival, Curbed and other blogs and to post news of its new Coney Island plan on the Coney Island Message Board. In fact, Kinetic Carnival and GL were the first to post stories about the plan on Sunday afternoon. We were so surprised to get an email from Thor spokesperson Tom Corsillo that we delayed posting until we checked out the IP address on the email and checked with another blogger. Has Thor's PR strategy entered a new phase? At least for now, it seems that the answer is yes. Thor made more renderings of its Coney Island plans available to GL and other blogs yesterday morning, and new lines of communication appear to have been opened. While the new plans have received mixed reviews--and the most skeptical reactions were quoted in the New York Times--this new, more inclusive approach to communications is a step in the right direction. Is the inclusion of online media in the communication plan an affirmation of the role that blogs are playing in coverage of development projects in Brooklyn, and in New York City generally? We'd suggest that it is and that's a good thing, generally, because any attempt to promote community dialogue is healthy. We've been tough on Thor and Mr. Sitt in the past, so we think it's only fair to say that this new and inclusive communications strategy is a positive thing. 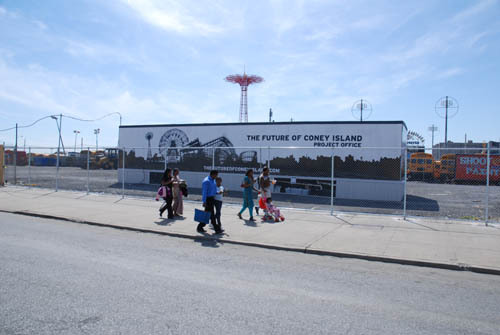 The debate about Coney Island redevelopment has never been an issue of pro or con. There are few people around that don't want to see Coney Island improved and don't want to see all those vacant lots (and ones used for school bus parking) returned to productive use. The discussion is clearly about the nature, density and design of the new developments. In that context, intense public discussion is a very good thing. The Coney Island PR strategy has gone through many iterations--early attempts to impress the mainstream media with glitzy designs, slow and calculated leaks of updated renderings to select print publications and reporters, combative public statements and veiled threats, quieter negotiations and, now, an approach that includes blogs and the online community of Coney Island devotees. Hopefully, the latter approach is more than another passing phase. We, personally, look at the latest plan and see condos that have morphed into hotel rooms and time shares and wonder how any Coney plan could pitch three hotels, given that one hotel has to be a sigificant financial gamble. If we were to wager, we'd look for the three "hotels" to be reduced in number along with the 400 "time shares" in the name of whatever zoning compromises and public subsidies for which Thor is angling. We understand that it's all about PR and political angling and wonder what this latest turn of events really means, still, the more informed discussion that takes place, the better off everyone will be. Great points... I have fussed a bit about the shift from condos to hotels/timeshares on my own blog, but I do have to give Thor Equities credit for reaching out to the bloggers and (apparently) being open to more dialogue. I think they are reaching out to bloggers and web media more mainly because the Mermaid Parade, Nathan's Hot Dog Eating competition and the Siren Festival are just around the corner and they are attempting to present themselves as "reasonable and cooperative", when the reality is they are basically an abusive landlord. Good people do good things, and the reality is the money Thor is spending on getting a PR firm to blanket press releases could be used for better things. Like at least cleaning up the trash and making the wooden fences around the now long gone mini-golf course, batting cage and go-kart track look a bit nicer. It's all smoke and mirrors folks. They want to build housing, condos, whatever they want to call it and kill off the amusement area. It's as simple as that.